A source is a collection of data which has been used to provide some information recorded in your family tree. 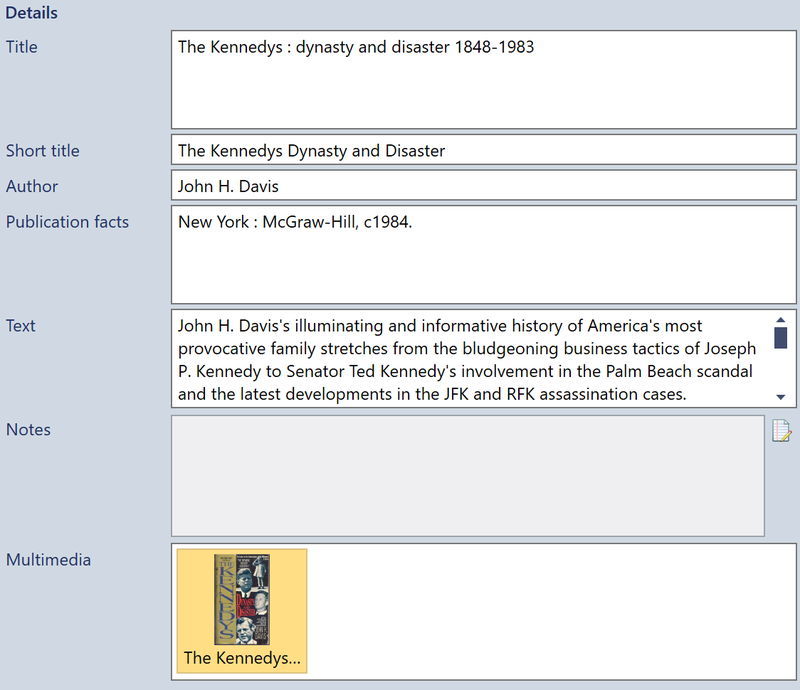 Full details of all sources referred to in your family tree can be recorded in the Sources view. Fig 1. The sources list. 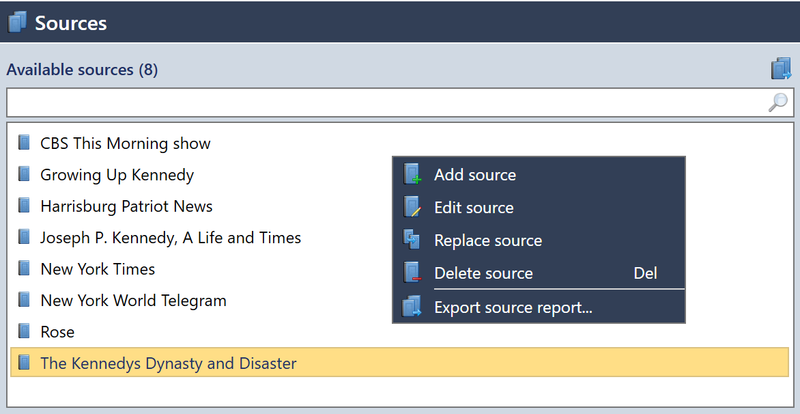 The list can be right clicked to add, edit, delete, or replace a source. The source details section is for recording basic information about the source such as its title and author. You can also add more detailed information about the publication of the source in addition to any multimedia relating to the source such as an image of a book cover or the contents page of the source. Fig 2. Adding source details. The source data section is for recording the type of data contained in the source, the period of time it covers, and the agency responsible for the data. You can record any relevant notes which will help someone interpret the data. Fig 3. Adding source data. The source repositories section is for recording which repositories hold the information referred to in this source. You can choose from a list of repositories and add the type of media and call number for the source in the repository along with any relevant notes which will help someone to access the information. The list can be right clicked to add, edit, delete, or replace a source. Fig 4. Adding source repositories. A repository is a place or an organisation which houses or owns a collection of sources. Examples would include a library or a genealogy website. You can record the name and address of the repository and any relevant notes which will help someone to access the information. Fig 5. The repositories list. Fig 6. Editing a repository.